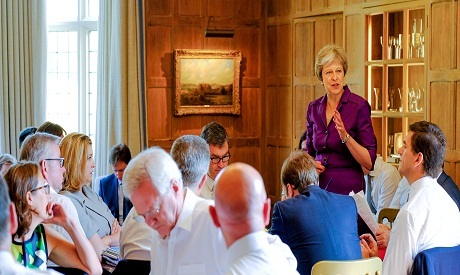 Britain's Prime Minister Theresa May commences a meeting with her cabinet to discuss the government's Brexit plans at Chequers, the Prime Minister's official country residence, near Aylesbury, Britain, July 6, 2018 (Reuters). British Prime Minister Theresa has persuaded her eurosceptic ministers to back a plan for closer trade ties with the EU after Brexit, but some of her MPs expressed alarm -- and she must still sell it to Brussels. After marathon talks at her country retreat on Friday, May's divided cabinet agreed on a new "free trade area" where Britain would accept EU rules for goods. There had been talk of resignations over the plan, which could keep Britain tied to the bloc for years after Brexit, even if officials stress parliament would reserve the right to diverge. But leading eurosceptics such as Foreign Secretary Boris Johnson fell into line, despite media reports that he described defending the proposal as like "polishing a turd". Cabinet was reportedly told there was no alternative that protected trade and avoided border checks with Ireland, a prospect that could upset the fragile peace on the island. Several pro-Brexit ministers publicly backed May after the meeting, as did both pro- and anti-Brexit MPs. The premier expressed hope the deal would end two years of public splits that sparked exasperation among European leaders and businesses seeking a clear path. In a letter to members of her Conservative party, she said "collective responsibility is now fully restored". "The only challenge that needs to be made now is to the EU to get serious about this, to come round the table and discuss it with us," she told the Sunday Times. But time is running out to secure a deal before Britain leaves the bloc in March. EU chief negotiator Michel Barnier said the plans would be assessed after they are published in a policy paper next week, to "see if they are workable and realistic". Douglas Carswell, who co-founded the official Brexit campaign in the 2016 referendum, welcomed the plan which he said would allow Britain to "incrementally" move away from the bloc. "A deal that guarantees us access to the (EU's single market) until such time as we chose regulatory divergence?... Sounds ok to me," he tweeted. But UKIP founder Nigel Farage, another key referendum figure, said it was a "sell-out" and left the majority of the economy "trapped" by EU laws. Taking aim at eurosceptic ministers, he said: "No resignations means that the so-called Brexiteers in cabinet don't have a principle between them." Veteran eurosceptic MP Bill Cash told the BBC he was "deeply disappointed". Jacob Rees-Mogg, the leader of the eurosceptic European Research Group (ERG) of Conservative MPs, said he would wait for more information. "If, when we get the detailed legislation, it turns out that it is a punishment Brexit, that it is keeping us in the European Union in all but name, I... will not vote for it," he said. A briefing circulated among the ERG, although not yet endorsed by it, suggested the government's plan would leave Britain a "vassal state in the EU's legal and regulatory tarpit". Any final deal must be approved by the House of Commons, where May has only a small majority thanks to the pro-Brexit Northern Irish Democratic Unionist Party. Before it goes to MPs, the plan must be agreed with Brussels, which has repeatedly warned it will not accept "cherry-picking" elements of its single market. Britain appears to do this by suggesting it maintain EU rules on goods but adopt greater flexibility on services and end free moment of people. Scotland's nationalist First Minister Nicola Sturgeon, who opposes Brexit, tweeted that it "reads like cherry-picking" -- but also welcomed its "realism". She added: "It is surely game on for those who would prefer to see a full single market/customs union" plan. May visited German Chancellor Angela Merkel on Thursday and reportedly showed her a draft of the proposal. She has also met recently with EU president Donald Tusk and Irish Prime Minister Leo Varadkar, who said he was briefed on the plan. Deputy Irish Prime Minister Simon Coveney said Saturday it "deserves detailed consideration", adding: "Lots of work ahead."